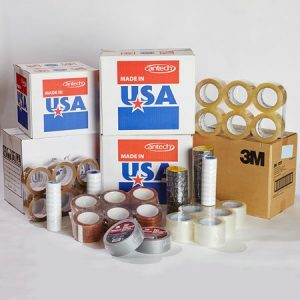 Fibers of Kalamazoo offers hundreds of tape options to fill a wide assortment of packaging needs. Masking, carton-sealing, protective, strapping, duct, plain and reinforced paper, etc. the list of our tape options is as long as the rolls themselves! We also carry tape dispensers and automatic tape machines. We are proud to carry trusted brands including Cantech (which is made in the U.S.), 3M, Intertape, and ATP. 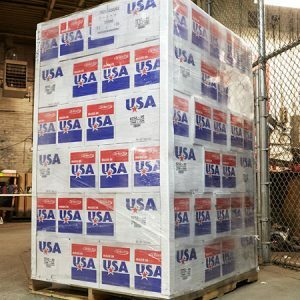 With tape and packaging products from Fibers of Kalamazoo you can be sure your shipments are securely packed and sealed! In need of additional supplies? We also carry corrugated boxes, void fill, bubble pack and foam, and a wide range of other packaging products! We also carry ice melter, protective wear, and other safety products to keep your employees and facility safe during any task or season. Fill out the form below or contact us today for more information. Our knowledgeable sales staff is eager to find the best tape and packaging products for your organization! You may also fill out a credit application form and/or Michigan sales tax and use tax credit exemption certificate form online. We provide value and relationship-driven services and products to our customers instead of just making a sale. From emergency deliveries and vendor-managed inventory to solution-based sales, we ensure that you always have what you need, where you need it, and when you need it. Put our customer service to work for your organization today!